With a view of the Las Vegas strip from Double Barrel Saloon and a cocktail in your hand it’s almost impossible to not lose track of time. There are games on the big screens, you’re making new friends at the bar and the comfort food that comes out of the kitchen is tempting you to stay even longer. Double Barrel Saloon is Vegas Casual, in other words it is so casually comfortable that you tend to stay longer than you should simply because you realize a vacation should be dictated by fun and not by a self imposed schedule. You might find a seat on the outdoor patio and feel the complete Vegas strip atmosphere or sit way back inside and get a feel for the sports bar vibe. The best seats in the house are right by the bar where you get a good slice of both. The open air environment is on one side and the bar and television screens are on the other. Double Barrel Saloon offers outdoor seating, good food, live music and enough good drinks to make it your spot for the entire evening. 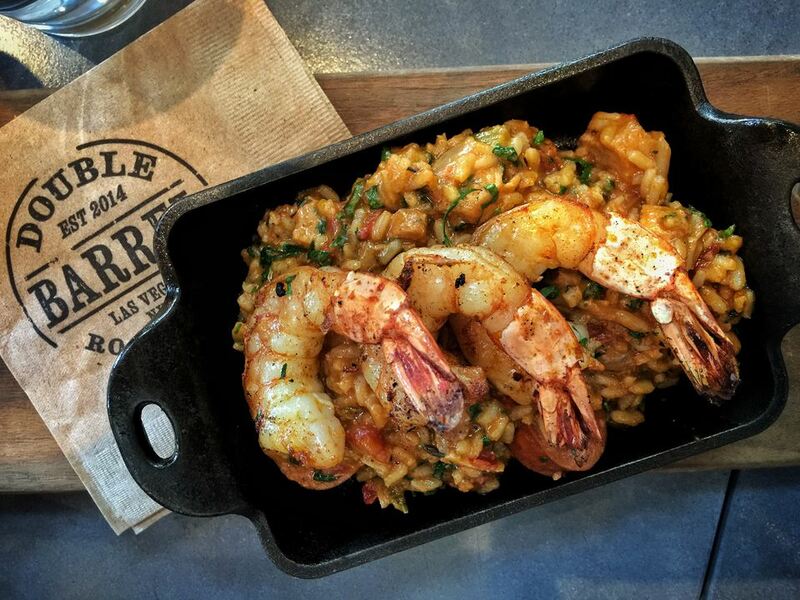 How’s The Food at Double Barrel Saloon Las Vegas? You might want to classify this as bar food but that would a bit harsh especially when the kitchen is pumping out some real food. This is not a “Gastropub” but it is a spot where you can a beer, watch a game and have good food that just so happens to feel real comfortable. They have an award winning burger, fried chicken that is among the best on the Las Vegas strip and enough small plate items to full fill your “snackability index” while watching a sporting event. If you go sliders and nachos with beer while you watch a game you will definitely get a quick idea of this elevated style of bar food. The best way to describe what is going on in the kitchen is to say that there is a real chef, creating real food in the kitchen and not just treating the menu like a necessary evil of a sports bar. DB Street Tacos – These simple tacos come with an avocado crème that would go well with some nachos and they add cotija cheese (not a fan). The steak tacos are at the top of the list with the pulled pork best reserved for a slider or a sandwich. Boneless Fried Chicken Bites - Addictive chicken bites that are perfect for pairing with beer especially with the habanero bourbon bbq. Nice little bites of white meat fried up just enough for some good flavor but not enough to get a lot of crunch. Smoked Southern Jambalaya – Giant shrimp on a bed of rice packed full of flavor. This is the dish that is full of flavor but goes very well with more than a few beers. Fried Chicken – One side , one biscuit and a long lasting yearning to have more. The right amount of crunch with the right amount of soul. Someone in the kitchen knows a little something about the south as they are serving up a brined barrel fried bird. Oysters – BBQ Baked oysters sound like a disaster but they are interesting. The oysters are baked and then some BBQ sauce is added in to the mix. Sweet, salty, smoky and worthy of a try. Still searching for the right place for a meal in Las Vegas?